Morning! So do you have a day off? Bret is home and he's helping me get the last of the preparations done for tomorrows Kitchen Kickoff. It seems weird that by the end of the day the very last of that avocado green should be gone from this house. When Bret first bought it there were green heavy drapes, green sculptured carpeting, green appliances, green cabinets, green countertops, green everywhere.. it was nuts. Bit by bit we eradicated it and after all these years, it will be gone. In today's demo-it-days it seems crazy that we still had any green at all, based on the ease of remodel on TV and people's dissatisfaction over anything dated. Yesterday was the Splendid Sampler kick off and by 9 am when I first looked the Facebook group was filled with completed blocks. So many clever fussy cut hearts! Very cute. The block is simple and sweet. I like fusible applique, so mine is machine blanket stitched. Don't you love the patchy background? This little candy message cracked me up. Pat often includes a 'wink' in her writings, and when I saw it I totally laughed out loud, it's Pat's block and there's her 'wink'. Beautiful block. I need to sew one too! I'm glad your house is getting to where you want it with new color - I know the feeling :)! 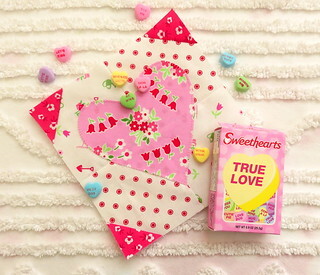 Gorgeous block....those PKM patterns and colours always look so lovely...and I love the little candy message! Cute block, Pam! 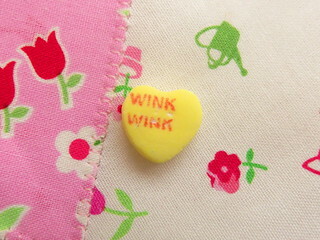 Wink wink! And good riddance to the avocado, right?! It's time for you to have a fresh new look! I'm sneaking in a comment from work. A person has to take a break now and then you know, to stay sane. Oh boy I remember avocado green. My mom got rid of it as fast as she could. My step father was color blind so he thought it was blind. Yikes. Our first house had the harvest gold and butcher block counters which I understand might be coming back. I hope not. Girl, I feel your pain about all the avocado green. I once purchased a house and all the rooms were painted celery green with avocado green carpet. I immediately painted all the rooms soft white and tore up all that UGLY carpet. There were beautiful hardwood floors underneath the carpet!! Your heart block is precious and I love the candy!